We all know by now that smoothies are a really effective way of getting nutritious foods and beverages condensed into one healthy little meal that's perfect for folks on the run. This makes smoothies an optimum breakfast or snack for kids, parents and grandparents alike. I don't keep any regular, dairy-based milk in the house. And we eat soy foods (like tofu and tempeh) regularly, so I generally don't put soy beverages in our smoothies. My preferred "milk" for smoothies (and cereals and granola) is almond milk. 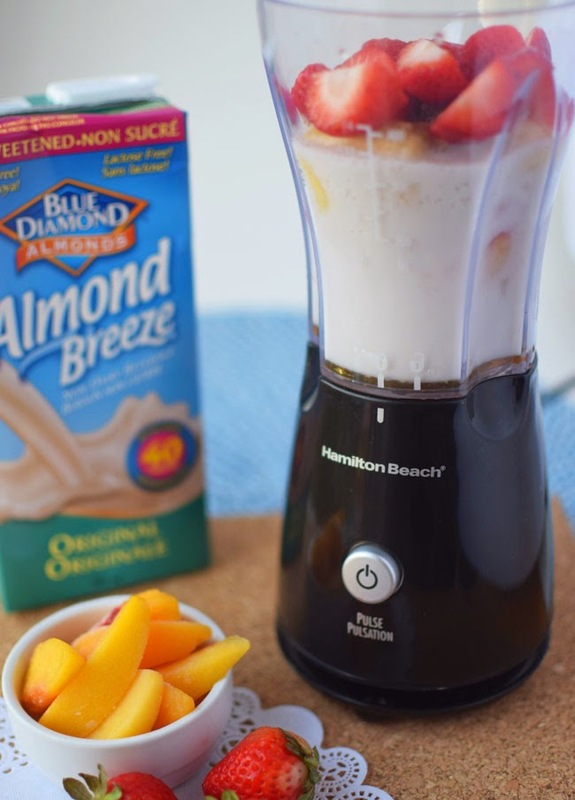 So when I was asked to create a recipe using Blue Diamond Almond Breeze, it was a natural fit. I settled on developing a new smoothie recipe. I was in the mood for peaches, so I picked up a bag of frozen, sliced peaches and made them the foundation of my recipe. I like to include some frozen fruit in my smoothies so I don't have to bother adding ice. I also included fresh strawberries, a half of a banana, ground chia seeds and a little bit of agave nectar for sweetness. Although Almond Breeze comes in several flavours (including chocolate!) I opted to use unsweetened original. Who needs sugar when you have fruit? (Okay, I cheated a bit by adding agave!) 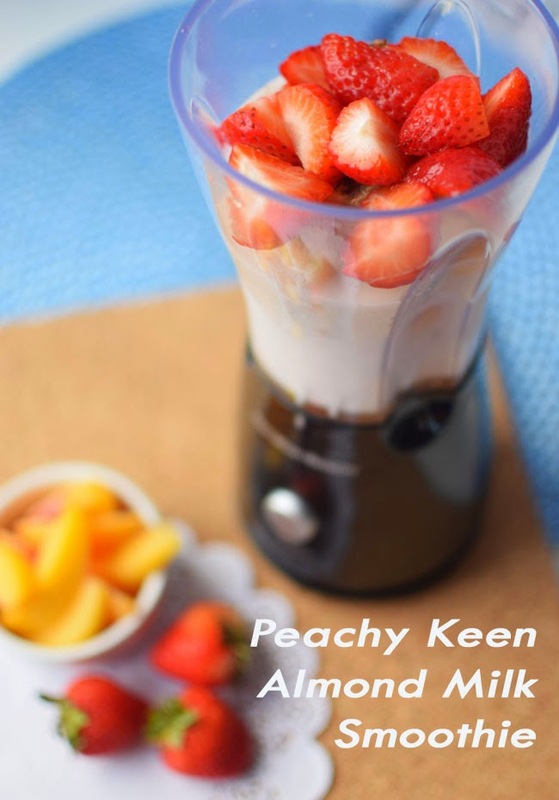 The resulting "Peachy Keen Almond Milk Smoothie" is smooth, creamy, lightly sweet and delicious. If almond beverages are new to you, I would urge you to give them a chance. Sometimes people who have been drinking dairy milk for many years find non-dairy alternatives odd at first. But you have to give your taste buds time to acclimatize to something new. You'll be glad you did! Almonds are a great plant source of vitamin E, calcium, iron and other important nutrients. Research suggests that almonds may help lower blood cholesterol. Almond Breeze is suitable for people with lactose intolerance and it's also a healthy option for people with diabetes, heart disease and celiac disease. Nutritional benefits aside, almond beverage is much more animal-friendly than regular milk too. I feel good about drinking it. I like the original Almond Breeze myself, but some people might prefer vanilla for use as a beverage or a cereal topper. 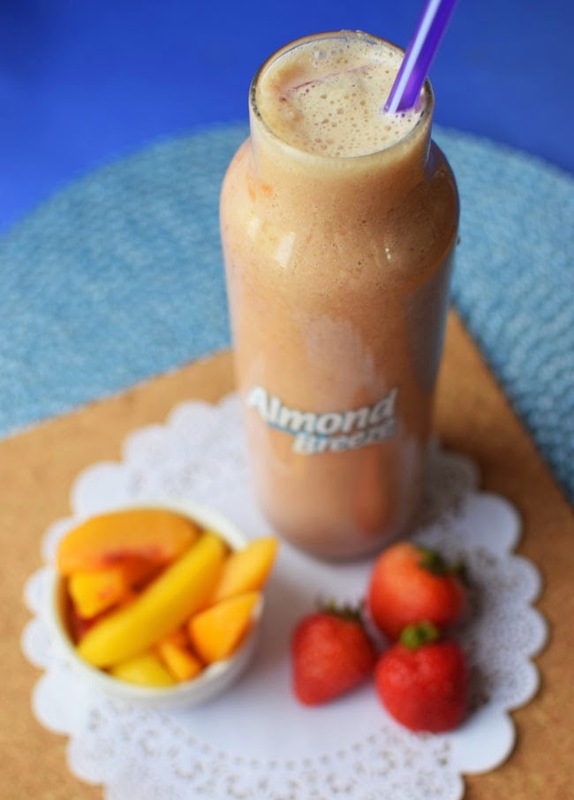 Stay tuned for another delicious Almond Breeze-based recipe coming up soon! Have you tried almond beverages? What flavour do you prefer? Disclosure: I am a part of the #CoolerWithAlmondBreeze campaign and received compensation for this post. All opinions are authentic and my own. Thank you for supporting the awesome companies that partner with Woman in Real Life. Linked up to Monday Funday. There's only one brand of almond milk readily available in South Africa and it's way too sweet so I only bought it once. I think unsweetened "milk" is the best to have because it's way more versatile and you can sweeten it as much as you want. Smoothies are my go-to breakfast lately, they are just so easy to make. I don't even bother with ice or anything frozen, but I might try that in summer. I agree with you about the unsweetened. What a shame you can't get more varieties. Sounds tasty! I need to get into smoothies more... I always forget about then once summer drifts away. This sounds great and healthy too. I need some of these recipes and I need to make these more often. My kids love them too. It's always nice when you can get healthy foods into the kids isn't it? Thanks Paula!